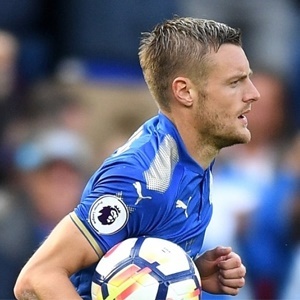 Huddersfield - Jamie Vardy scored twice as Leicester beat Huddersfield 4-1 on Saturday to make it four successive wins in the English Premier League. Youri Tielemans and James Maddison also scored for Brendan Rodgers' side. Aaron Mooy scored the only goal for already relegated Huddersfield on the day he met an American girl who gained inspiration from the midfielder's shaven head during her cancer treatment. Tielemans curled in the opener from 20 yards in the 24th minute before Vardy latched onto Ricardo Pereira's pass and produced a fine finish three minutes into the second half. Mooy immediately gave Huddersfield hope from the penalty spot following Caglar Soyuncu's challenge on Karlan Ahearne-Grant. Huddersfield's special guest, seven-year-old mascot Bella from Texas, was flown over from Dallas after revealing that Mooy was her unlikely hero during last year's Soccer World Cup after she lost her hair during treatment for brain cancer.